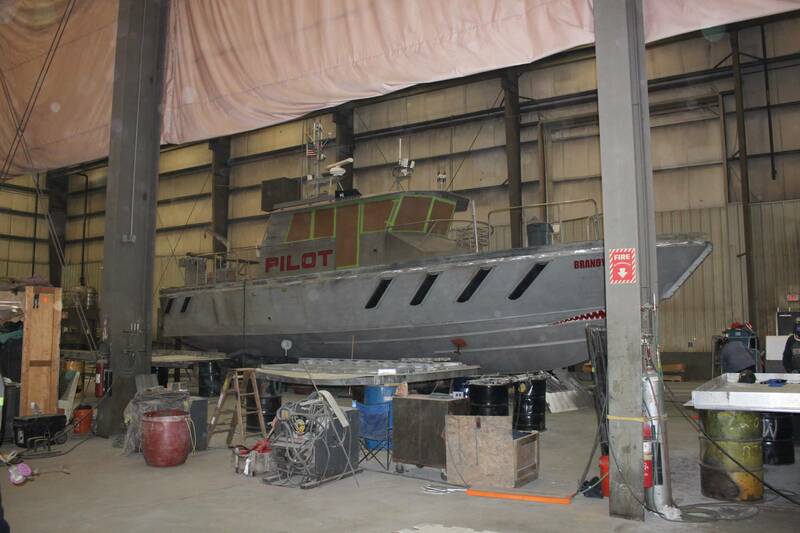 The Duclos family is iconic in boatbuilding circles, as the Somerset, Mass.-based Gladding-Hearn, Duclos Corporation, has built a strong heritage in the pilot boat and fast ferry sectors, and in total more than 425 vessels have been delivered since it was founded in 1955. Today a trio of second-generation siblings run the yard, brothers and co-presidents John and Peter Duclos with sister Carol Hegarty serving as CFO. 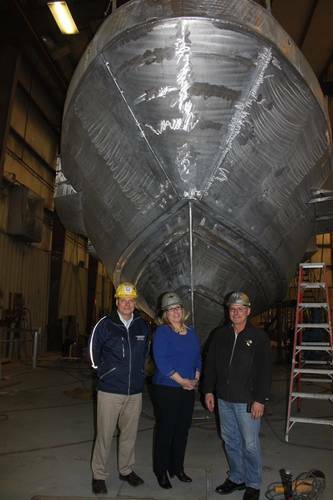 Maritime Reporter & Engineering News visited the yard recently and found the yard bustling with newbuild activity. The personal connections at Gladding-Hearn are only a part of the story, but a critical base to understand how this small Northeast U.S. boat builder has flourished while others have failed; an essential ingredient that extends beyond the Duclos clan to their employees and customers alike. It started in 1955 when George Duclos, chairman, at age 22 co-founded the yard with Pret Gladding and Richard Hearn. Nearly 30 years in 1983 George bought out his partners, but before he pulled the trigger on the deal he called his eldest son John, who was working at Bath Iron Works. “My father called and said that the partners wanted to retire, and that he was trying to make a deal for the shipyard,” said John. “He said ‘if we do that, you’ll have to come home.’” The call was expected as they had talked for years about the opportunity to run their own business, and according to John “the stars aligned and it worked out.” Peter and Carol were still in school at the time, so in 1983 John joined his parents at the shipyard, located on seven acres on the deepwater Taunton River in Somerset, Mass. While each of the siblings had their own path back to the family business, all started at the shipyard in their high school and college years part-time, and all started with the same humbling task: “We all cleaned the office,” said Carol. Today they form a formidable shipbuilding management team, well-educated and experienced with individual skill sets that mesh well, rooted in humble beginnings that guide business and relationships as they serve a cadre of loyal repeat customers while always scouting new opportunities. In 1977, the shipyard delivered America’s first Z-drive tractor tug. In 1978, it joined forces with designer C. Raymond Hunt to build the first launch with a deep-V hull, now an industry standard. It became an Incat Crowther licensee in 1987, becoming the second shipyard in the country to build high-speed passenger catamarans. To date the company has built 88 pilot boats – and in 2014 it built the first pilot boat application of Volvo Penta’s IPS drives in the U.S. – as well as 42 high-speed catamaran ferries since it started building them 30 years ago. The portfolio is rounded out with tugboats, research vessels and a long list of patrol and pilot boat projects for various international customers, including Bermuda, the Bahamas and the Colombian navy. “We don’t say no to anything, we’ll consider just about anything,” said Peter. In some respects, the process of running an efficient boatbuilding business remains the same as it did in 1955. “Mr. Gladding wrote ‘Appreciation of a Small Shipyard,’ – a SNAME Paper – in the early ‘60s, and some of the principles and business systems that they developed when they started this company in 1955 are still in place today. There are different tools, but the philosophies remain the same,” said John. But in other respects, the business is completely different. While computerized tools and 30 years of experience certainly help, there are no exacts in boatbuilding, which remains both an art and a science, as Peter admits “There are some projects that you’ll get midway and say ‘why did we take this one?’ But our philosophy is to stick it out, deliver the boat and hope to keep a customer. 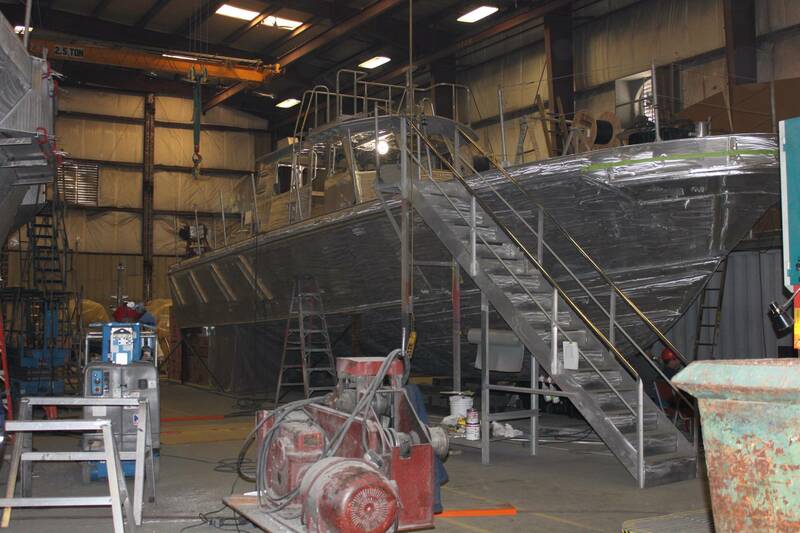 Some of our worst projects have become our best customers,” said Peter, noting that nearly 90% of the boatyard’s work comes from repeat customers. Investing any boatbuilding enterprise is a 24/7/365 endeavor, as keeping the plant in shape and adding new technologies is a valuable tool in maintaining efficiency and profitability. 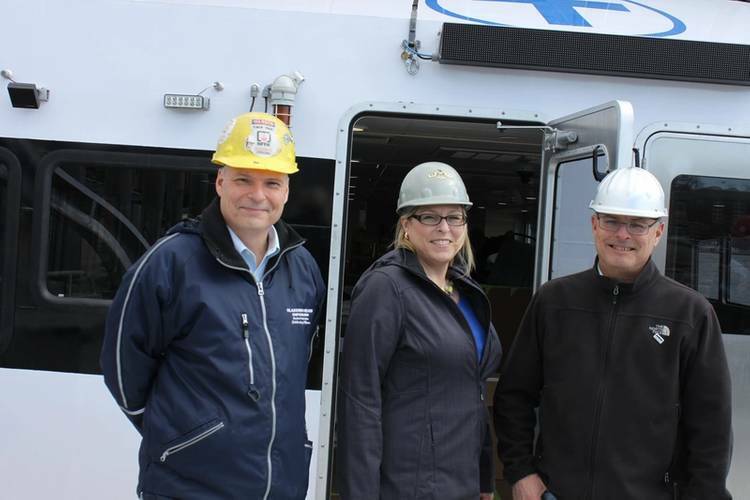 “About 10 years ago we got in on the ground floor of small shipyard grants from the Maritime Administration, we got lucky and we qualified, allowing us to invest in infrastructure,” said Carol. Investment in fresh infrastructure is abundant and readily visible across the facility, with new piers, cranes, forklifts, welding machines and plasma cutting machines, as well as the behind-the-scene items such as new electrical service and the latest CAD design tools. “That MarAd program has been very helpful for many yards to improve infrastructure,” said John, and while Gladding-Hearn did not apply this year, they have some plans for 2019. Investment doesn’t stop with hardware, and the trio agrees that keeping and maintaining a loyal and competent workforce is the number one challenge. “Training, at all levels is a big challenge: from safety, to environmental compliance, to skills training,” said Carol. To that end the company recently embarked on a two-year program seeded by funds from a Massachusetts workforce training grant “that will touch everyone in this company, including us,” said Carol, who recently took courses with her brothers on LEAN Management and Six Sigma. For the program Gladding-Hearn partnered with Bristol Community College, who co-wrote the grant and provide the professors and trainers on-site at Gladding-Hearn.  The Alabama Pilot, Inc. in Mobile, Ala., received a new Chesapeake Class pilot boat from Gladding-Hearn Shipbuilding, Duclos Corporation. The boat measures 53.5 x 17.6 with a 4.75 ft. draft. The all-aluminum pilot boat features the signature C. Raymond Hunt-designed Deep-V hull and is powered by twin Caterpillar C-18 diesel engines, each delivering 671Bhp at 2100 rpm and a top speed of 27 knots. A Humphree interceptor trim-tab control system was installed at the transom. Diesel capacity is 800 gallons, which shipyard officials say, provides a range of at least 400 miles at an economical speed of about 20 knots. The engines turn 5-blade NiBrAl propellers via Twin Disc MGX-5135A Quickshift gears. The launch is equipped with a 9kW Northern Lights EPA Tier 3-compliant genset. 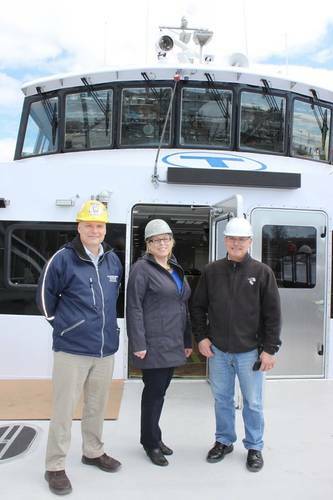 Glory, the second Incat Crowther designed 27m catamaran ferry built by Gladding Hearn for MBTA of Boston has been delivered following on from sister ship Champion. When Champion was launched late last year, she was the 500th Incat Crowther designed vessel to enter service; Glory takes that number to 529. The design is optimized for bow loading, with double-width gates and doors. The bow design integrates with existing shore based infrastructure and the wheelhouse is designed to meet strict visibility requirements, allowing the captain to clearly see the foredeck. Among the challenges of a modern commuter operation is the ever-increasing demand for passenger amenities. Champion and Glory deliver in this area with full disability regulation ADA compliance (including 4 wheelchair spaces and accessible bathroom), concession stand, luggage racks, bicycle storage for 10, a ticket counter, the requisite trash receptacles and of course, WiFi. Glory’s entire superstructure is isolated by resilient mounts, to reduce noise and vibration in the cabin, allowing the vessel to exceed the contractual requirements. Glory is powered by a pair of Caterpillar C32 Acert engines, driving Hamilton HM571 water jets, for a service speed of 26 knots and a top speed of 30 knots.